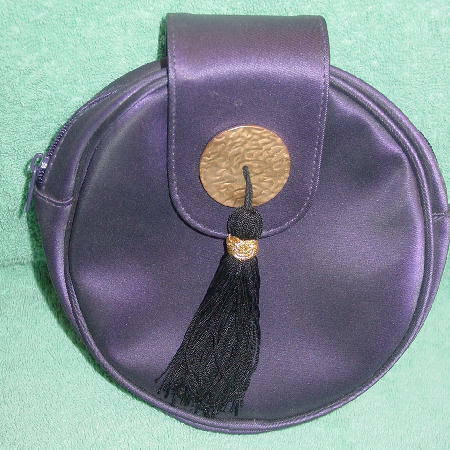 This never-used round iridescent vinyl purple-plum evening purse was made exclusively for Yves Saint Laurent Parfums. It has a black plastic lining and a side to side zipper opening. The top 2 5/8" wide strap has a hidden snap closure. On the front of the strap is a gold-tone hammered circular ornament with a black loop extending outward which connects to a 4" long tassel with a gold-tone cord accent. The colors are deeper and more iridescent than they appear in the picture, and the purse looks better in person.